Below are downloads of our window and door details in a PDF-format. For CAD-file, please contact us by email. As a building professional, you create masterpieces that protect your clients from the elements. These masterpieces deserve windows and doors of only the highest caliber. Anyone can make a window—what we offer is the ultimate in climate controlling comfort. That comes with the promise of full support for you every step of the way. Each of our windows can be custom made to any technically feasible specifications. If you need it, we can make it look and perform like you dream it. With more than 10 years of designing and manufacturing these ultimate windows, we are more than suppliers of building products. We serve as highly knowledgeable support partners, helping you bring your project vision and goals to life. Our team understands the interrelation between ultimate performance building components in design, construction and operation. We offer support to architects during the shop drawing stage by optimizing details to meet design, performance and ease of installation. For builders, we supply all parts relevant to installation. We respond in a timely fashion to delivery, installation, commissioning and maintenance related issues. When needed, we will support your building project at the construction site or handle the installation. Achieve the highest comfort level without the support of mechanical systems. The key to this requirement is establishing surface window temperatures that are as close to the interior space temperature as possible (within 5°K). This is the basis of Passive House Institute certification. Provide a high level of daylight. Daylighting is making use of the available daylight and is measured in light transmission value (t-visual). Our standard triple-glass performs in the area of a good double-glass with of light transmission value of 70% or better. 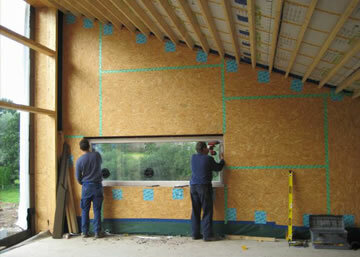 Achieve thermal bridging in frame construction and installation detailing. Our frame design, in combination with the ability to install this frame at the appropriate place in the wall assembly, allows for a true integrated approach to achieve the outstanding performance requirements required by the Passive House standard. Water and air infiltration in frame construction and detailing. All Tanner Windows and Doors meet the highest tested air infiltration class in Germany and are rated as 'Class 4'. The minimum value for this class is a the Q-value of 0,75 m"/hm at Q-100. Low SHGC glass can be a sound strategy in most instances to gain the appropriate amount of 'free/passive' heat to a building during the wintertime. This requires the incorporation of an appropriate external shading system, which Tanner Windows and Doors offers. Please contact us for more information. If you are looking for additional high performance building products, please contact us or visit peakbp.net.